Periodically while reading A New Earth I found myself pausing and asking “what does he mean?” Usually I would have to read and re-read the particular sentence or passage before the words sunk in. I found this happening with more frequency when reading the last few chapters of A New Earth. As has been discussed in previous chapters, we often identify ourselves by our names, jobs, positions, physical attributes, and so forth. These are external attributes and roles and attachment to our roles can impede our ability to live in the present moment. In other words, it is okay to identify ourselves by our roles but we shouldn’t become so attached to the role that when that role ends (e.g. such as leaving a long term job position) we don’t know who we are or what else to do. 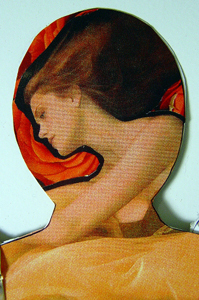 According to Eckhart, when you realize who you are NOT, then who you ARE will be revealed. Hmm, okay; big pause here. This realization may occur when something we identified with is gone. This loss could be through death, disaster, or even loss of social position. When this happens we have two choices: resist or accept. When we resist, we fight the present situation; we are reactive and confrontational. When we accept the situation, we go through the suffering and increase our awareness. We accept the present moment. Another way to understand who you truly are is through abundance or acknowledging the good that is already in your life. Too often we think that WHO we are is how we see ourselves treated by others. We aren’t respected. We don’t receive recognition. We aren’t loved. Our needs are not being met. We believe we have nothing to give or that people are withholding what we need. “Poor me.” Instead of acknowledging the good already in our lives all we see is lack. And acknowledging the good in our life is the basis of abundance. you are withholding from the world. and that you have nothing to give. In other words, if you don’t let flow whatever it is that you think the world is withholding, you won’t know that you have it already within you. Outflow determines Inflow. Or “what you give, you get.” Tell people you appreciate them. Praise someone for a job well done. Say thank you more often. Smile at a stranger. When you acknowledge abundance, when you express gratitude, when you see the fullness in life, you send out positive energy, you begin to live in the present moment and in that moment you may find who you truly are. Categories: Inspiration, Spirituality, Uncategorized | Tags: A New Earth, abundance, Eckhart Tolle, gratitude, Oprah | Permalink. 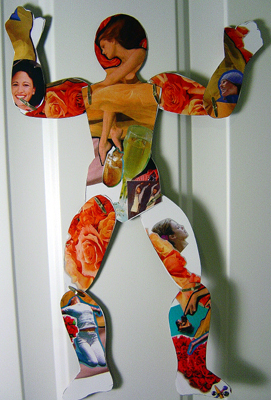 In another assignment from the online workshop, The Transformative Nature of Art Dolls, we were tasked with creating a two-sided paper doll that reflected both our good days and bad days; the bright and dark sides. The idea was to depict these bright and dark sides through images and colors with as few words as possible. As I was putting mine together The Style Council’s “My Ever Changing Moods” began playing in my head. My good day or bright side has cheery colors, lots of smiles, and an overall great feeling. This image pretty much describes how I feel on a good day. On those dark days, I feel trapped, chained down by my feelings, and want life to go away. Sometimes I’m in a “fighting” mood. 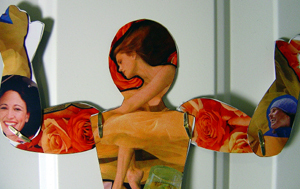 Categories: Amy's Art, art, Art Dolls, Collage, Creativity, Inspiration, Mixed Media | Tags: moods, Paper Dolls, Style Council | Permalink. Authentic spirituality awakens the soul, reconnects us with the sacred, and fills us with the passion of life. Spiritual development is not about religious rituals and practices; it is about waking up to the wonder of life. Categories: Favorite stuff, Inspiration, Quotable Monday, Quotes, Spirituality | Tags: David Elkins, Spirituality | Permalink. My local artist guild, The Bolton Artisans Guild, started its own blog this week. Below is an expanded version of an entry I posted on the new BAG blog. 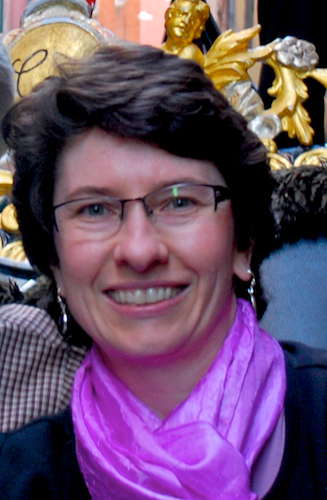 Alyson Stanfield discusses artist slumps her newletter this week. I can certainly relate as I’ve been in an on-again/off-again slump for the past few months. I’ve noticed this happens each winter, typically in February or March or both. I first became aware of my artist slump about 3 years ago when I was part of an art salon group that included Judy Dunn and two members of the Bolton Artisans Guild. That first one was pretty deep and lasted several weeks. It was a little scary in fact; scary in the sense that I couldn’t believe how much it affected me. Boy was that little inner voice active and making its presence known. However, as my awareness of the slump increases, the shorter the slump seems to last and the better I am at accepting it. The little voice doesn’t have much of an opportunity to say things because I accept the moment as it happens. I now refer to this as my “rebirthing” time; a time of regeneration and of gathering new ideas. Here is what Alyson recommends to emerge from a slump. Wallow; it is okay to wallow a little bit. Honor your emotions. I know this can be hard because we feel we’re supposed to always be producing art. But sometimes you don’t want to or you don’t want to do the art you think you’re “supposed” to do. Acceptance of the slump is key. When you accept it, you don’t resist it, and then you can move through it. Plan something with a deadline to get the juices flowing. 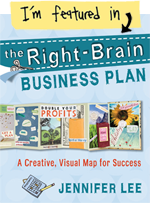 Creating a “brain drain list” (thank you, Christine Kane) and having a “check-in buddy” to help me meet those deadlines has been very helpful. Get out of the studio; walk, run, go to a museum. Talk to other people; meet friends, visit a gallery; goes hand in hand with #3. As artists we often work in isolation. There is nothing like meeting a friend for food & conversation or an art date to reset your muse. Create an escape path; continue to make your art even if it isn’t great. During this season’s artist slump, I played around with other mediums as a break from polymer clay. Great fun! Write; journal about your emotions, your dreams, whatever is inside your head. Read inspirational books or biographies about other artists. Listen to CDs or audio downloads that motivate you. Watch movies or documentaries to remind you of your connection to art and the art world. (Don’t watch stuff that will depress you, make you sad, angry, etc.) As my awareness of my artist slump increases I find I don’t want to watch the news or read the newspaper as much as I did before. I’d rather do something pleasant or watch something pleasant. The external negative energy does not help. Purge and clear out stuff that you don’t need. Lots of clutter = negative energy. I’m a strong believer in this one. When I have too much clutter in the studio, my muse practically disappears. When I clear things out, the energy flow is much better. To read more of Alyson’s recommendations visit here. To listen to her podcast on this topic, go here. 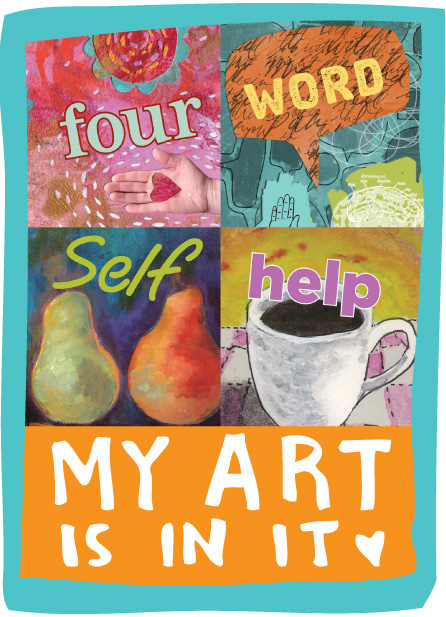 Categories: Balance, Creativity, Inspiration, Networking, Opportunity, Self-confidence, Spirituality | Tags: Alyson Stanfield, artist slump, Bolton Artisans Guild, energy | Permalink. This past weekend while visiting family in New Jersey, Eric and I had the opportunity to visit the Frida Kahlo exihibit at the Philadelphia Museum of Art. I admit that I’m not a big fan of Kahlo’s work. It seems flat and folky on one hand and just bizarre on the other hand. But because she was such a force in the art world and someone that I was not very familiar with, I decided to get tickets to the exhibit to learn more. Kahlo was born in Coyoacan, a suburb in Mexico City. She was a polio survivor and intended to become a doctor but a horrific accident at the age of 18 changed those plans and the course of her life. The accident, which fractured her back, collarbone, and ribs, shattered her pelvis, and injured her shoulder and foot, left her convalescing for more than a year. It was during this period of recovery that Frida started painting; primarily self-portraits and still lifes. At the age of 21 she met Diego Rivera, an artist 20 years her senior. 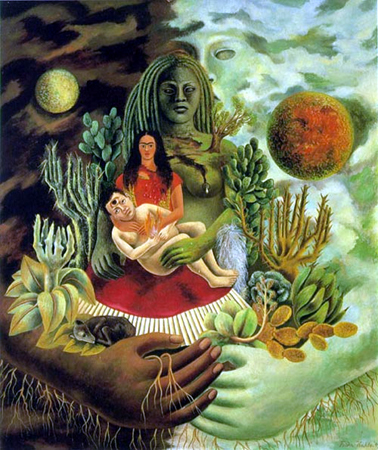 Their tumultuous relationship (marriage, divorce, infidelities, remarriage) lasted until Kahlo’s death in 1954. 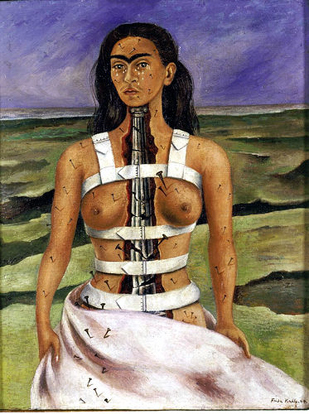 And it is the near constant pain from her accident and frequent surgeries, a miscarriage and her inability to have children, Rivera’s affairs, and politics that are reflected in Frida’s paintings. Now I understand the power behind her work. I’m still not crazy about it but I admire her ability to express herself so freely and so independently. 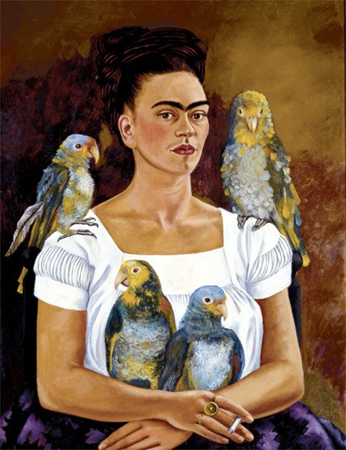 As with many artists, Kahlo did paint more traditional pieces (e.g. still lifes) which sold more readily than the disturbing pieces that came from her soul. But it is those haunting, bizarre, and tragic images that stay with you. Through this exhibit I also learned more about the symbolism in Kahlo’s paintings and her frequent inclusion of animals and pets who took the place of the children she could not have. This exihibit also included numerous photographs of Frida, Diego Rivera, their friends and family which provided another aspect into her life. Yes, she did smile. This exhibit is on display at the Philadelphia Museum of Art through May 18, 2008. Note: The image on the cover of the brochure is titled Self-portrait with Thorn Necklace and Hummingbird/Autorretrato con collar de espinas y colibri (1940). The photograph of Frida was taken in 1932 by her father, Guillermo Kahlo. 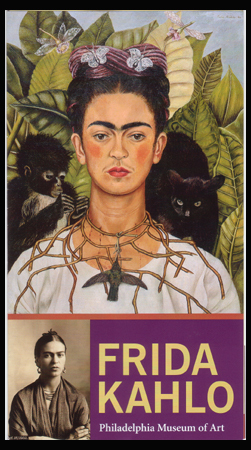 Categories: art, Art Date, Artists, Creativity, Favorite stuff, Inspiration, Museums, Spirituality | Tags: Frida Kahlo, Pennsylvania, Philadelphia, Philadelphia Museum of Art | Permalink. Of course the natural follow-up to learning about the pain-body is to learn how to rid yourself of the pain-body. The first step in breaking free of the pain-body is to realize that you have a pain-body. The second step is to stay alert and present enough to notice the pain-body in yourself because when the pain-body is recognized, it no longer has power over you. When you don’t identify with the pain-body, it cannot control you or your thinking. Try to become aware of your reaction as it arises. Initially, you might realize what you said or did after the fact; an hour later, a day later. You know that realization when it hits. The “oh crap, did I say that or do that?” It can be a major dope-slap moment. But give yourself credit for recognizing it. The fact that you recognized it is a start. Over time, the space between the emotion, the reaction, and your realization that it is happening will decrease. As your awareness increases, you begin to feel the emotion as it starts and then you can contain the emotion by being present. It is also important not to supress the pain-body, the negative emotion. Supressed pain-bodies are more toxic than openly active ones because repressed negativity equals negative energy. You may pick this up on this energy when you meet certain people. You may feel it in people you know. When you feel the pain-body, the emotion, the reaction starting to rise in you, don’t start to think that there is something wrong with you. Know that the emotion, the reaction, is happening and follow the knowing with acceptance. By accepting, you allow yourself to feel whatever it is that you are feeling in that moment. That is part of being present. Categories: Favorite stuff, Inspiration, Intuition, Opportunity, Self-confidence, Spirituality | Tags: A New Earth, Christine Kane, Eckhart Tolle, Oprah | Permalink. Two Zen monks, Tanzan and Ekido, were walking along a country road that had become extremely muddy after heavy rains. Near a village, they came upon a young woman who was trying to cross the road but the mud was so deep it would have ruined the silk kimono she was wearing. Tanzan at once picked her up and carried her to the other side. The discussion about the pain-body, the hurt from our past, was probably the most anticipated webcast thus far. Through our pain-body a voice in our head develops. The voice in our head has a life of its own and many of us are possessed by that voice. The voice in our head tells a story that the body believes in and reacts to; those reactions are emotions. Our emotions, in turn, feed energy back to the thoughts that created the emotion in the first place. Now we find ourselves caught in a vicious circle between thought and emotion. Imagine living life like the monk Ekido; someone who was unable to internally let go of situations and who continuously collected “stuff” inside his head. Think about how many of us live carrying around burdens of the past in our minds. Eckhart describes the pain-body as an accumulation of old emotional pain which we carry in our energy fields and feed through the voice in our head. I know that voice pretty well; the one that tells me I’m lazy or unattractive or boring or whatever other little jewels it can come up with. I’m sure you’ve had a few discussions of your own with the voice in your head. As children we are very sensitive to strong negative emotions. Strong negative emotions that are not faced and accepted and let go of are carried with us into adulthood. This can include not only childhood pain but also pain experienced in our teen years and into adulthood. And when we feed into this pain and the negative talk, it may manifest itself outwardly as anxiety, anger, overeating, unhappiness, addictions, and drama. A great deal of alertness and presence is required to not be drawn into our own drama (that voice again) or into another person’s drama. To step out of the negative thought pattern, you must recognize it for what it is-an inner voice, your ego, trying to get your attention, trying to drag you into its drama through a trained thought pattern. When you recognize that voice for what it is, when you come into the present moment through deep breathing or by focusing on another object such as a flower or by listening to external sounds such as birds chirping, you step out of the negative thought pattern. Things that were said to us in the past, perhaps repetitively, become lodged in our minds. By bringing presence to these thoughts now, by realizing that these are old thoughts, and nothing more than old thoughts, then these old thoughts no longer have power over us. Accept the negative emotion (anger, sadness, etc) that comes with the thought, accept it in the present moment, and become aware of it. Remember too that our parents only acted at their level of consciousness. They did the best they knew how to do at their level of consciousness. Blame them if you must; but know that you are the only one who can dislodge the past by raising your own level of consciousness through awareness and presence in the current moment. Categories: Favorite stuff, Inspiration, Spirituality | Tags: A New Earth, Eckhart Tolle, Oprah | Permalink.